INDIAN WELLS, California -- Add the Koch brothers' network to the list of those questioning President Donald Trump's recent executive order on immigration. In a statement released Sunday, an official for the political network led by the Republican billionaires, said the organization believes Trump's ban on immigration from seven predominately Muslim countries will likely be "counterproductive." "We believe it is possible to keep Americans safe without excluding people who wish to come here to contribute and pursue a better life for their families," Brian Hooks, who oversees the Koch network's bi-annual seminars, said. "The travel ban is the wrong approach and will likely be counterproductive. "Our country has benefited tremendously from a history of welcoming people from all cultures and backgrounds. This is a hallmark of free and open societies," he added. On Saturday, as demonstrations broke out at airports across the country in response to Trump's immigration executive order, roughly 550 of the Koch brothers' top donors gathered near Palm Springs, California, for their network's winter seminar. Officials for the network told reporters they were encouraged by some of what they've seen so far from the new administration, but that it's too soon to say for certain. They pointed to Trump's regulatory reforms, his executive order on the Keystone pipeline, and some of his Cabinet appointments as areas where the Koch network is hopeful. "There's been some good things, for sure," Mark Holden, a top official for the network, told reporters of Trump's first full week in office. Such optimism is a shift from the Koch brothers' critical view of Trump during the campaign. The controversial political donors did not spend any money on the then-Republican nominee, focusing instead on supporting down-ballot races. The immigration ban was not a major topic of conversation here at the palm tree-filled oasis, however. Charles Koch didn't mention it during remarks at the opening reception, nor was it a topic of discussion during the post-dinner panel with Republican Sens. Pat Toomey, R-Pennsylvania, James Lankford, R-Oklahoma, and Mike Lee, R-Utah. Instead, the focus was on issues like health care and tax reform. Proud of how they did in races this past November, the network announced plans to be even more aggressive in their spending next cycle, as they hope to maintain control of the House and Senate. 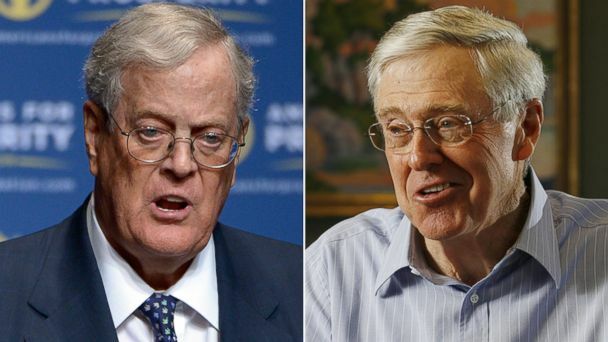 According to a spokesperson, the Koch network will spend between $300 and 400 million dollars on politics and policy during the 2018 races, up from $250 million in 2016. "We had by far the most productive year in the history of this network," Charles Koch told donors about this past cycle. "We're just getting started."